The United Nations Children’s Fund (UNICEF) estimates that almost half a million kids are living in 16 besieged areas across Syria, which has been gripped by a deadly foreign-sponsored militancy for over five years. UNICEF said in a press release on Sunday that the 500,000 children are trapped in areas almost completely cut off from sustained humanitarian aid and basic services, some for nearly two years. The agency also said that 100,000 children are living under siege in militant-held eastern part of Aleppo city alone. “For millions of human beings in Syria, life has become an endless nightmare – in particular for the hundreds of thousands of children living under siege,” said UNICEF Executive Director Anthony Lake. UNICEF further called for lifting the siege in Syria to allow unconditional humanitarian access. The situation in Aleppo is of particular concern as the city remains divided between government forces in the west and terrorists in the east. 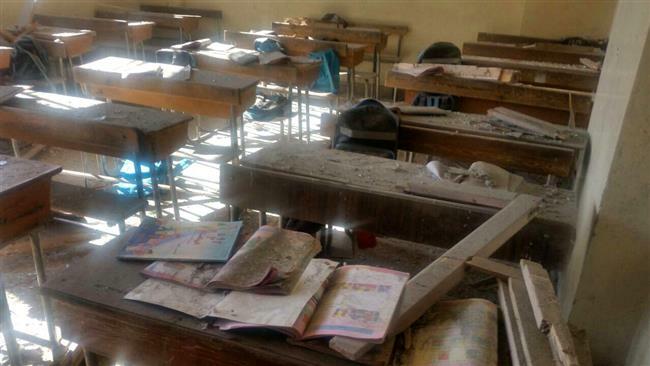 Last week, at least eight children lost their lives in a militant attack on a school in western Aleppo. The Syrian army has set up several humanitarian corridors for people to leave Aleppo. However, terrorists are said to be preventing civilians from leaving the city in a bid to use them as human shields. Locals say they are scared to use the exit routes for fear of militant snipers as well as mines and bombs planted by Takfiri elements. The militants have been dealt heavy blows over the past few months amid advances made by Syrian army forces and their allies on the ground, with the support of Russia’s aerial campaign. More than 400 civilians have reportedly managed to flee the eastern Aleppo controlled by terrorists as the Syrian government forces tighten the noose around the militants in the battered city. 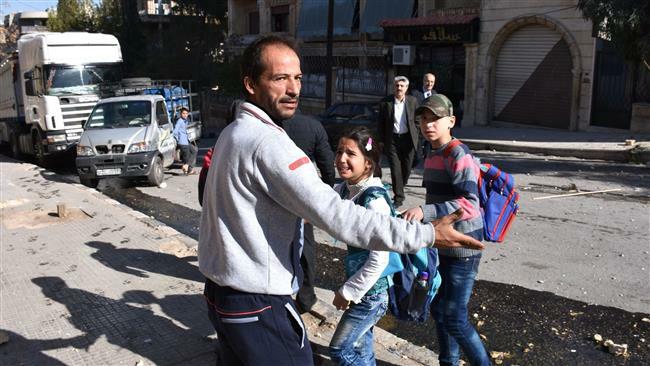 The so-called Syrian Observatory for Human Rights said on Sunday that the civilians escaped overnight to Aleppo’s recently liberated district of Masaken Hanano and were taken to government-held regions. Syria’s official SANA news agency reported that army soldiers on Saturday evening secured the exit of tens of locals who were besieged by terrorists, and transported them to a safe area. Local authorities are working to provide the civilians with relief aid, the report added. Meanwhile, in what is regarded as a major breakthrough in Syria’s anti-terror fight, the army soldiers and their allies retook Masaken Hanano, the largest neighborhood formerly held by the militants, on Saturday. Separately on the same day, there were reports of clashes between Syrian troops and militants in the nearby districts of Haidariya and Sakhur. The terrorists, however, intensified their rocket attacks on western Aleppo overnight, leaving at least four civilians dead and dozens injured, the observatory said.